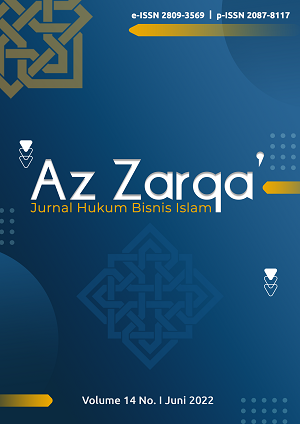 Al-Mazaahib merupakan jurnal dalam bidang Hukum Islam yang dimiliki Prodi Perbandingan Mazhab Fakultas Syari'ah dan Hukum UIN Sunan Kalijaga Yogyakarta. 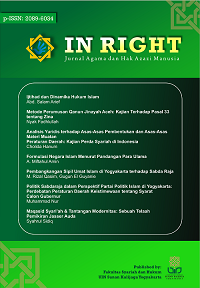 Al-Ahwal: Jurnal Hukum Keluarga Islam, published by Al-Ahwal Research Centre of Department of Islamic Family Law, Faculty of Sharia and Law, State Islamic University Sunan Kalijaga Yogyakarta since 2008. The subject covers textual and fieldwork studies with various perspectives of Islamic Family Law, Islam and gender discourse, and legal drafting of Islamic Civil law. In the beginning the journal only served as a scholarly forum for the lecturers, professors, and students at the State Institute of Islamic Studies. However, due to the later development, the journal has successfully invited scholars and researchers outside the Institute to contribute. Until now, with the fair procedure of double peer-review, Al-Ahwal: Jurnal Hukum Keluarga Islam continues to publish researches and studies concerned to Islamic Family Law, Gender Discourse, and Legal Drafting of Islamic Civil Law with various dimensions and approaches. 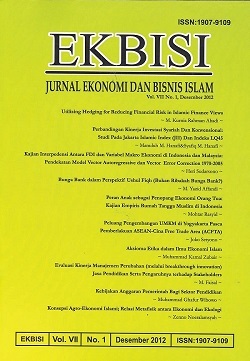 Al-Ahwal: Jurnal Hukum Keluarga Islam, published twice a year, always places Islamic Family Law, Gender Discourse, and Islamic Civil Law in the central focus of academic inquiry and invites any comprehensive observation of Islam Family Law as a normative Islam and a system of society and Muslims as those who practice the religion with their many facets. Al-Ahwal: Jurnal Hukum Keluarga Islam is a member of Crossref.org, so all its article has its unique DOI number. Al-Ahwal has been accredited with the Grade “2” by the Ministry of Research-Technology and Higher Education Republic of Indonesia: 21/E/KPT/2018. Authors who want to submit their manuscript to the editorial office of Al-Ahwal: Jurnal Hukum Keluarga Islam should obey the writing guidelines. If the manuscript submitted is not appropriate with the guidelines or written in a different format, it will be rejected by the editors before further reviewed. The editors will only accept the manuscripts which meet the assigned format. Al-Ahwal: Jurnal Hukum Keluarga is going to publish journals in June and December. Please submit your manuscript. The Authors can download the template HERE. Al-Ahwal: Jurnal Hukum Keluarga, with registered number ISSN 2085-627X (print), ISSN 2528-6617 (online) have been indexed on: DOAJ (Directory of Open Access Journal); SINTA - Science and Technology Index; road directory of open access scholarly resources; Moraref; Crossref; Google Scholar; Aifis, Academia, Worldcat; Indonesian Publication Index (IPI); Indonesian Scientific Journal Database (ISJD); Bielefeld Academic Search Engine (BASE); Directory of Research Journals Indexing (DRJI); Harvard Library; Universiteit Leiden; Eurasian Scientific Journal Index (ESJI); The University of Sheffield; The University of Oxford; Ghent University Library; CiteUlike; EBSCO; Microsoft Academic Keys; Academic Resource Index; Nelson Mandela University; Scipers; Universitat Bonn; UIC; Pusan National University Library; CORE; copac; Boston University; and Scilit. SUPREMASI HUKUM merupakan jurnal ilmiah dan media komunikasi ilmiah antar peminat ilmu hukum. Semua elemen masyarakat, baik civitas akademika, praktisi, lembaga masyarakat, maupun perorangan yang berminat terhadap bidang hukum untuk berpartisipasi mengembangkan gagasan, wawasan, dan pengetahuan melalui tulisan dalam jurnal ini.